The Elegant Variation: "LIKE LINCOLN, I WAS A LOUSY IMMIGRANT"
Fantastic insights into Bellow's life, and lots of interesting "between the lines" stuff about his marriage and how it influenced his story lines. Great post, Mark, and much congratualtions on your latest news! Have not read it but will have to seek it out now. Thanks. This was truly an elegant piece of posting. A lovely bit of curating given the manuscript page. It would be fun to read a letter or two of Bellow's, even without the manuscript, contemporary with the writing of the letters in Herzog. I like to imagine Bellow writing those letters. He had to be pacing. Could he possibly have written them sitting down? What a great letter! 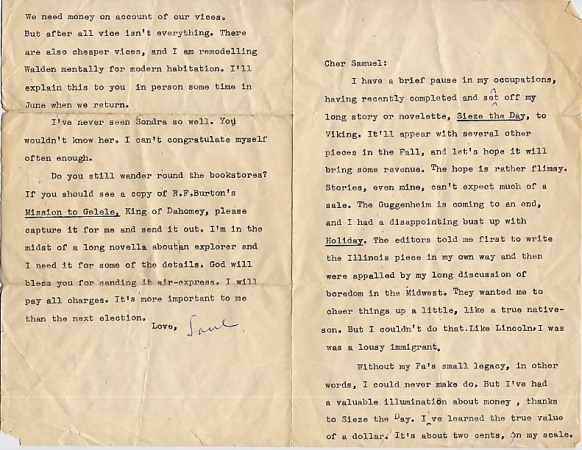 I was looking at a letter I received from Saul Bellow back in 1996, a full 40 years after the one above was written, and notice that he signed his name in exactly the same way. My letter won't fetch $1900, nor would I sell it even if it might. I was completely bowled over when a Nobel Prize Winner personally responded to what amounted to a fan letter.